GRC Prescription Stat: Why healthcare cyber security will stop your heart. Lazarus Alliance unveils the next generation GRC technology for healthcare cyber security crime prevention. With nearly 84% of data losses attributed to healthcare cyber security, Lazarus Alliance released the next generation antidote to fight compliance failures, corporate fraud and criminal cyber-misconduct with the IT Audit Machine (ITAM). According to the Identity Theft Resource Center out of the reported 177 cyber security breaches recorded this year a whopping 83.1% are associated with healthcare. When cyber criminals spend an average of 200 days inside your company before being discovered, this percentage is going to get far worse. It may seem as though the bad guys are winning and the good guys don’t stand a chance but it’s just that the good guys are not using the right tools. Considered to be the best assessment tool for governance, risk and compliance (GRC) in the global business community, this next generation of ITAM ups the ante by managing big data and frameworks with virtually endless possibilities. These new enterprise capabilities coupled with the already powerful analytic and logic features are a technological force to be reckoned with. HIPAA regulations are complex and expertise in deciphering this regulatory mystery is in short supply which is one reason ITAM is such a great solution. We removed the guesswork from compliance completely. With intuitive and guided questionnaires you cannot make mistakes and missteps putting your company at risk. Gone are the days where audits, assessments and compliance work was overshadowed by endless spreadsheets, version control madness, escalating costs and audit anarchy. The IT Audit Machine puts the power of technology, collaboration and simplicity to work for the entire enterprise and does it in a progressive, proactive way. Cyber-crime prevention is of paramount concern to organizations of all sizes, all industries and on all parts of the world. Lazarus Alliance put its extensive experience in cybercrime and fraud prevention in the governance, risk and compliance (GRC) spaces to work for the global business community. “Healthcare providers globally are under increasing attack by cyber criminals and current trends show this trajectory exponentially increasing further still. Lazarus Alliance is proactive cyber security with our HIPAA compliance and assessment automation modules.” said Peters. Lazarus Alliance’s primary purpose is to help organizations attain, maintain, and demonstrate compliance and information security excellence, in any jurisdiction. Lazarus Alliance specializes in IT security, risk, privacy, governance, cyberspace law and compliance leadership solutions and is fully dedicated to global success in these disciplines. 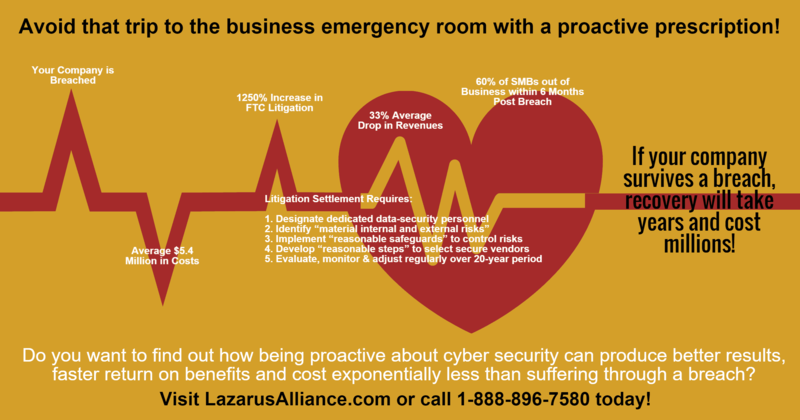 Learn more about Lazarus Alliance and why Lazarus Alliance is Proactive Cyber Security™!